The freedom of sailing around the Greek Islands is something I thought you could only dream of. Waking up each morning and having breakfast out at sea with the sun on your face and the breeze in your hair is just the start. Going for a swim and snorkelling in the clear blue waters, with many fish below the waters surface, dolphins swimming alongside your yacht and ending each day with a sea view sunset is simply magical. Escaping the busy city of Athens and being welcomed by the Greek locals was extremely refreshing. Our Greek skipper knew mostly everyone on each island so we were guided to the best restaurants, bars and swim spots. Our first stop was the island of Agistri where we anchored and took a dinghy to the wharf. Here we hunted down a well-earned Grecian feast in the harbour at a restaurant called Kouros Cafe Bar. After a night sleeping on the yacht, we awoke to the most beautiful sunrise and couldn’t resist jumping off board into the clear blue ocean. Early that morning we set sail and headed to Epidaurus, a great place for experiencing Greek culture and food. Also to visit the Epidaurus Ancient Theatre, one of the most extensive sacred sanctuaries in ancient Greece. This breathtaking theatre, which seats up to 14,000 people was built approx. 4th Century BC, if that isn’t amazing the views alone are worth the visit. The theatre was out of this world and in my opinion very underrated in terms of a tourist location. It was the middle of the day and I would say there were 20 people max visiting, which is nothing compared to the vast size of the theatre. Rent out a quad bike for the day, Poros is quite large and hilly so you won’t want to walk everywhere. This island has a few nice beaches and luxury resorts you can visit for the day. Unless you are a kind of historian or simply love an in depth experience into the history of Greek mythology, the temple of Posiden is not worth the hike (nor worth the quad bike up). However the views are vast and beautiful, as is the sunset. Ranked as Greece's most historical village, Ermioni isn’t full of tourists and is a great place to unwind and relax. A lot of celebrities come here to get away from the public. After a morning visit to Drougas Bakery, where you will find the best Frappes, donuts and pastries, head through Orange forrest and find a private swimming spot. Ermioni is also a great place to eat seafood for dinner. Sailing into Hydra island you are welcomed by the stunning landscape and hill side houses. Wheeled vehicles are banned here, so cue quaint cobbled streets and donkeys. You can spend half a day looking through the shops and exploring the town. At the end of the day head up to Sunset restaurant and enjoy a cocktail with a view - it is not called sunset restaurant for nothing. One word: pistachio. If you love them, you have come to the right place. The Greek Island of Aegina grows some of the best pistachios in the world and they are known for it. The island and its stalls are filled with not only the nut itself but pistachio oils, butter, chocolate, nougat and more! 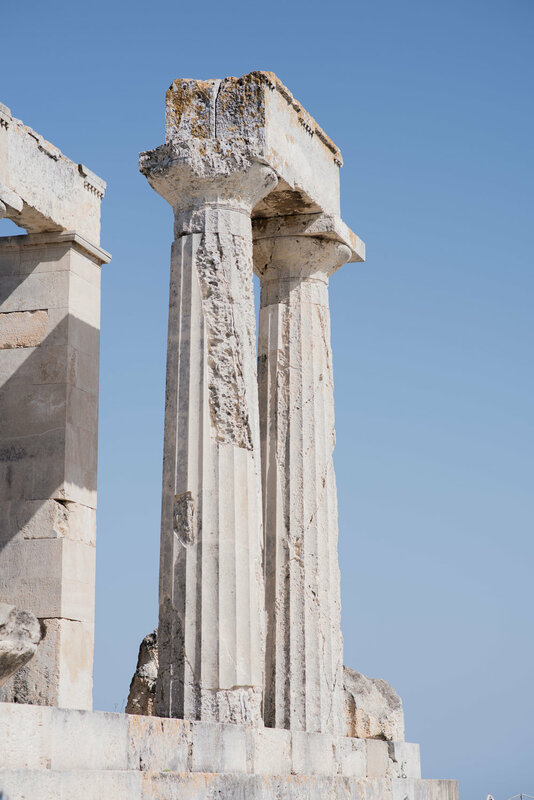 Aegina is filled with more than just pistachios, explore the island’s ancient treasures: Athena’s temple and the old monastery.